Veterinary medicine has undergone sweeping changes in the last few decades. Women now account for 55 percent of the active veterinarians in the field, and nearly 80 percent of veterinary students are women. However, average salaries have dropped as this shift has occurred, and even with women in the vast majority, only 25 percent of leadership roles are held by women. These trends point to gender-based inequality that veterinary medicine, a profession that tilts so heavily toward women, is struggling to address. How will the profession respond? What will this mean for our students and schools? What will it mean for our pets entrusted to veterinarian care? Who has succeeded in these situations? Who is taking action to lead change? What can we learn from them to lead the pack in our lives? Leaders of the Pack, by Julie Kumble and Dr. Donald Smith, explores key themes in leadership and highlights women in veterinary medicine whose stories embody those themes. In it, Kumble and Smith cull over three years of interviews to profile a wide variety of women as they share triumphs and challenges, lucky as well as tough breaks, and the sound advice and words that inspired them to take their careers in unanticipated directions. By sharing unique stories that illuminate different paths to leadership and reflecting on best practices through commentary and research, Leaders of the Pack will allow more female leaders to create wider pathways to the top of their profession. Julie Kumble is a researcher, writer, and director in women’s leadership and was the founding director of the Leadership Institute for Political and Public Impact at the Women’s Fund of Western Massachusetts. She has been a US State Department Fellow, recipient of the International Women's Day award, grantee of the Foundation for Motivated Women, and US Peace Corps volunteer. Dr. Donald F. Smith served as the ninth dean of Cornell University’s College of Veterinary Medicine. An accomplished large animal surgeon and an avid veterinary historian, Smith’s digital collection of first-person interviews with veterinarians who began their careers during the 1930s and 1940s is a national veterinary treasure, and his popular blog at www.veritasdvmblog.com attracts readers from around the world. 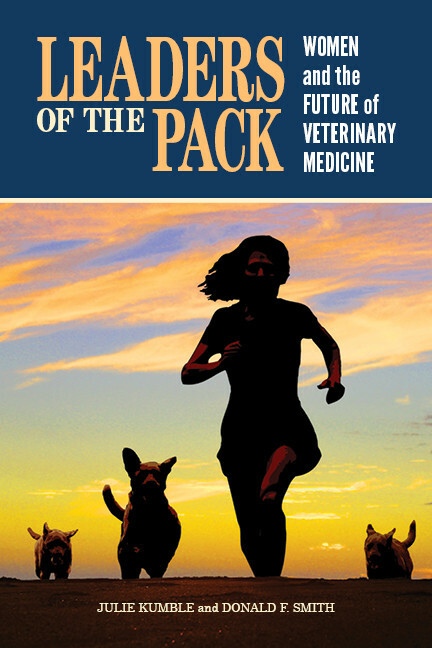 His commissioned book on the fiftieth anniversary of the Association of American Veterinary Medical Colleges, Pathways to Progress, was released to wide acclaim in 2016. Smith was a diplomate of the American College of Veterinary Surgeons and a member of the National Academy of Practices. He passed away on October 29, 2016.